The emergence of Brood V of the 17-year periodical cicadas (Magicicada spp.) lived up to all expectations within the "cicada zone" in eastern Ohio, parts of West Virginia, and a very small part of southwest Pennsylvania. Adults emerged in huge numbers, they climbed trees or flew to new trees, males serenaded cicada females with cacophonous songs only appreciated by the females, and mated females inserted eggs into stems. The cicada adults are now dead and gone. Cicada females had used their sharp ovipositors (ovi = egg, positor = deposit) to create slits in tree stems. They then inserted eggs into the slits much like inserting letters into an envelope. Their damage to the vascular system commonly caused the stem beyond the slits to die. The structural damage sometimes caused the affected stem to break and drop to the ground. However, if stems remained attached, the leaves dehydrated, wilted, and turned various shades of brown producing a symptom called "flagging" because it now looks like small flags tied to the ends of branches. The cicada eggs hatch after a few weeks and the resulting nymphs either drop from the trees to the soil or if the damaged stems detach, the nymphs simply step-off into the soil. Either way, the Brood V nymphs will burrow into the soil to spend the next 17 years imbibing juices from tree roots. Cicada flagging is very apparent inside the Brood V "cicada zone." We're getting questions from people who have driven through the zone, but who live outside the zone. They are asking what is happening to the trees. This is understandable because the flagging can be dramatic. I saw this while driving to a training program yesterday in Vinton County. I also observed two other things that can make identifying the culprit causing the flagging a challenge. First, cicada populations were highly variable within the emergence zone. Locations with heavy flagging were bounded by areas with little to no flagging. This is normal for a 17-year or 13-year periodical cicada emergence. The speculated reasons for this discontinuity are many including the elimination of nymphs at some point by soil disturbances (e.g. tree removal and soil re-grading for construction or farming) or a reduction in nymphs by forest tree harvests that degraded the nymph's food supply. The second thing I observed was a variation in oviposition damage among tree species that may be due to the tree's response to the physical injury and/or due to localized cicada population densities. The literature lists over 270 plant species as oviposition hosts with total numbers and exact hosts varying between sources. 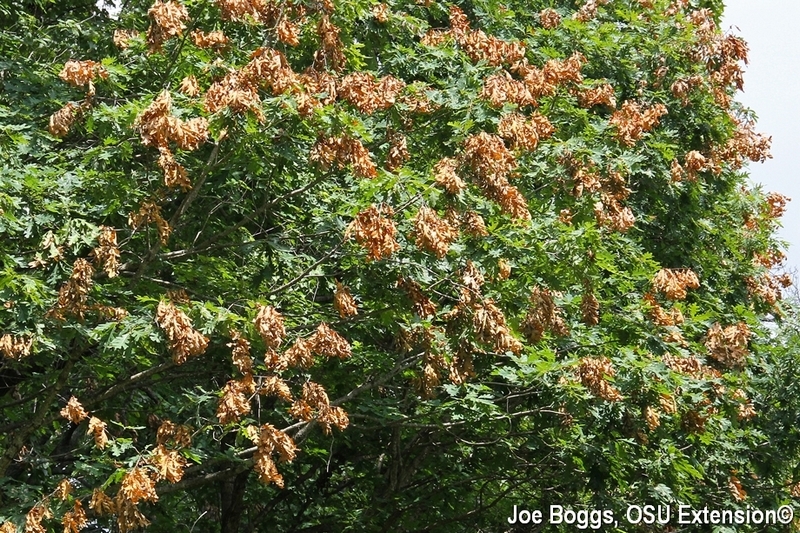 However, in Ohio, the trees showing the heaviest flagging are oaks, maples, honeylocusts, and a few other hardwoods. Of course, we need to be cautious with connecting flagging to host preference because some tree species appear to respond more dramatically to the damage compared to others. Also, all bets are off where cicada population densities are exceedingly high; females will lay eggs on many trees and shrubs that are not including on the "host list" including conifers. No doubt the sticky sap flowing from the oviposition wounds in pines, spruces, and firs limits the success of the nymphs exiting their poorly selected tree hosts. One can only imagine the nymphs pondering, what was mom thinking?